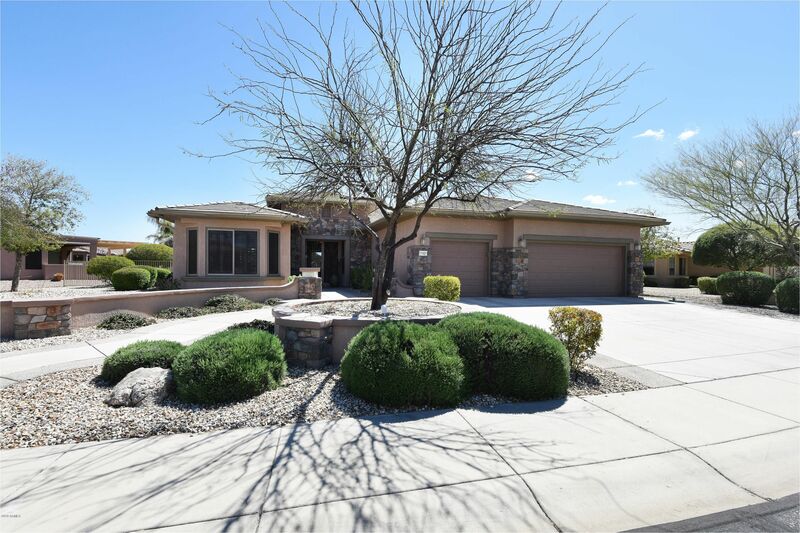 Leolinda Bowers has listed another rare Sun City Grand home! It's pool weather! This estate model home has a 3 car garage, pool and private yard! Exquisite Del Webb estate model Ashbury nestled on an oversized lot with superior backyard paradise! Home is adorn with rock stone veneer, a unique blend of textures and colors. The kitchen in this jewel features beautiful slab granite counters, upgraded stainless steel appliances, gas cook-top, large island, breakfast bar & bay window in breakfast nook. Master bedroom has a bay window, patio exit door, two sinks in master bath & custom closet organizers. Guest bedroom has its own private full bath. Other fine features include plantation shutters, 18-inch tile, powder room, warm inviting wall colors & a spacious den. Backyard invites you to relax around the expanded patio, at the kiva outdoor fireplace or in the large tranquil Pebble Tec salt water pool. Life is grand when you live in Sun City Grand!